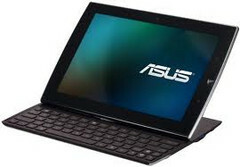 Asus has released their new Eee Pad Slider in the markets of US and Canada this week. Asus has been showing this 10inch Android model since January. This model comes with a slide out keyboard which hide behinds the screen when you are not using it. This QWERTY keyboard provided can be helpful for most of the users who are finding it quite uncomfortable in accessing the Touchscreen as the on screen keyboard of most of the Android tablets are provided with small and cramped keys. According to the source the sliding mechanism even seems pretty solid. No track-pad has been provided with the device, as the selecting purposes can be easily fulfilled by touching the screen directly rather than using a mouse or a track-pad. Well, using a track-pad is much more frustrating than selecting directly. The plus point with the intact keyboard is that the Keyboard shortcuts can be used and this will minimize the time you need to tap the screen. And as for Specifications this model is provided with a 10inch screen supporting a resolution of 1200 x 800pixels on an IPS capacitive multi-touch display made from scratch-and-damage-resistant Gorilla Glass. It is mainly powered by Android 3.2 version Operating system and a 1 GHz NVIDIA Tegra 2 dual core processor. It is provided with a 1GB of DDR2 RAM and two options for the storage as 16GB and 32GB. Two cameras also add one to its front of 1.2 MP while other to its rear of 5MP. The Tablet’s dimensions measure about 10.8” x 7.1” x 0.7” and weighs around 2.1 pounds. A 25 Whr battery is provided with it which can give a backup up to 8 hours. The slider is currently up for order on Amazon, B&H, and Newegg. It is available in brown or white. The model with 16GB of storage is priced $479 while the 32GB version for $579.